In This Issue: RAISE Family Caregivers Act the law of the land, state caregiver assistance, bundled payments, Medicaid work requirements, SNF quality concerns, provider performance penalties, Pfizer bows out on Alzheimer’s, transitional care and ERs, SNF patient assessments of preventable hospital readmissions, dementia care, long-term care insurance sticker shock, the ongoing HRRP debate, technology and decentralized care, patient-doctor communication and empathy, advance directives for dementia sufferers, and how to help and not help grieving mourners. Will they or won’t they? Will the Republican House and Senate take a stab at entitlements in 2018? That was a major question as the New Year began; the signals, though somewhat mixed, appeared to predict that any major efforts to restructure Medicare, Medicaid, and Social Security would not be pursued during the current Congress. But if the mega safety net battle does stay off limits, 2018 has nonetheless brought forth a slew of other developments with major implications for families, patients, caregivers, and healthcare and health policy professionals. On the plus side, albeit of limited initial significance, Congress passed the RAISE Act prior to its year end adjournment. The RAISE Act , quickly signed by Pres. Trump, should serve to elevate to new visibility the need for actions that employers, government, healthcare providers and others can take to augment the medical, household and financial care from relatives and partners. Action may include caregiver training, respite options, caregiver-friendly workplace policies, innovative caregiving models and addressing disparities around the unique needs of diverse caregivers. Contributing to this heightened visibility will be a new national Family Caregiver Advisory Council consisting of key governmental, public and private players involved in caregiving issues. Commonwealth Fund writers offer a case study of a program designed to help patients with terminal conditions and prognoses navigate their physical and emotional challenges as their health deteriorates. 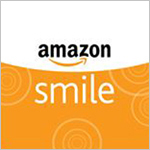 “Advanced Illness Management” (AIM) is the approach being implemented at Sutter Health, a large nonprofit delivery system in California. AIM staff coordinate often complex treatment regimens and educate patients and families on recognizing signs of decline and asking for help to avoid complications. The program also places a heavy emphasis on advance care planning to ensure patients’ goals and treatment preferences are elicited as their conditions evolve, which may mean more or less intensive care at the end of life. 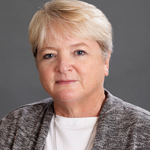 According to Sutter, patients in the AIM program spend fewer days in the hospital in the last three months of life relative to the most recently available national benchmark and make less use of intensive care units. They are also less likely to die in the hospital. While transfers to hospice and deaths in hospice are on par with national averages, AIM patients are admitted to hospice earlier. Patients give the program high marks, with more than 80% responding positively to survey questions about care coordination and communication, symptom management, and knowing their rights and responsibilities. The National Academies of Science Engineering and Medicine (NASEM) has announced it will be holding a two-day workshop February 12-13 to explore the “landscape and potential approaches” regarding physician-assisted death. The workshop, NASEM stated, “will serve as a neutral space to facilitate dialogue and explore what is currently known about physician-assisted death—and clarify gaps in research and data collection in order to help inform potential new approaches to addressing challenges faced in the provision of care. The workshop will not focus at length on the moral or ethical arguments for or against the practice of physician-assisted death.” Registration for the workshop, which is open to the public in person or by webcast, is available at NASEM’s website . The Kaiser Family Foundation has developed a web-based tool to enable advocates and other interested individuals to access explanatory and comparative information regarding the various CMS-proposed models and demonstrations testing ways of paying providers to deliver health care to people with Medicare. “Medicare Delivery System Reform: The Evidence Link” contains material to understand the models’ costs and potential or realized savings, as well as participating populations, from beneficiaries to care providers. Do Medicaid Work Requirements Make People Healthier? 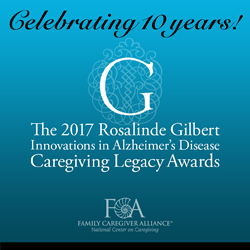 In celebration of the 10th year of the Rosalinde Gilbert Innovations in Alzheimer’s Disease Caregiving Legacy Awards , Family Caregiver Alliance and The Rosalinde and Arthur Gilbert Foundation are pleased to announce three winning organizations—each with outstanding programs that address the needs of caregivers for people with Alzheimer’s disease. 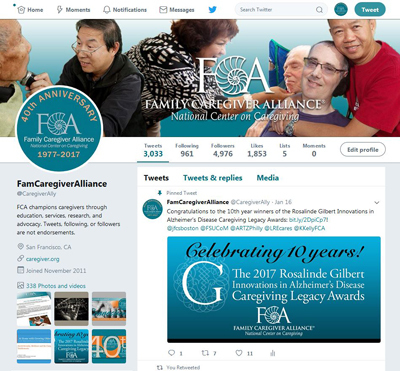 Representatives of the winning organizations will receive their awards at a reception held during the Aging in America Conference in San Francisco, March 26 to 29. The reception will take place on Tuesday, March 27, 6 p.m. to 8 p.m. , at the Parc 55 Hotel. The reception is open to the public. Join us! 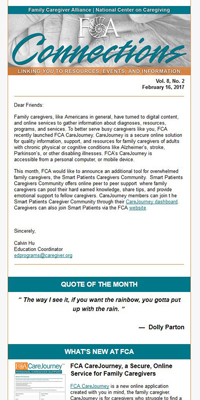 Follow us at twitter.com/caregiverally .